Every dog or cat deserves the best quality of life for the longest time possible. The goal of rehabilitation is to assist your pet to regain as much of their function back to previous (pre-injury) level as possible. Sports medicine is the field of medicine and surgery that is aimed at prevention, diagnosis and treatment of injuries resulting or associated with sporting/athletic activities. 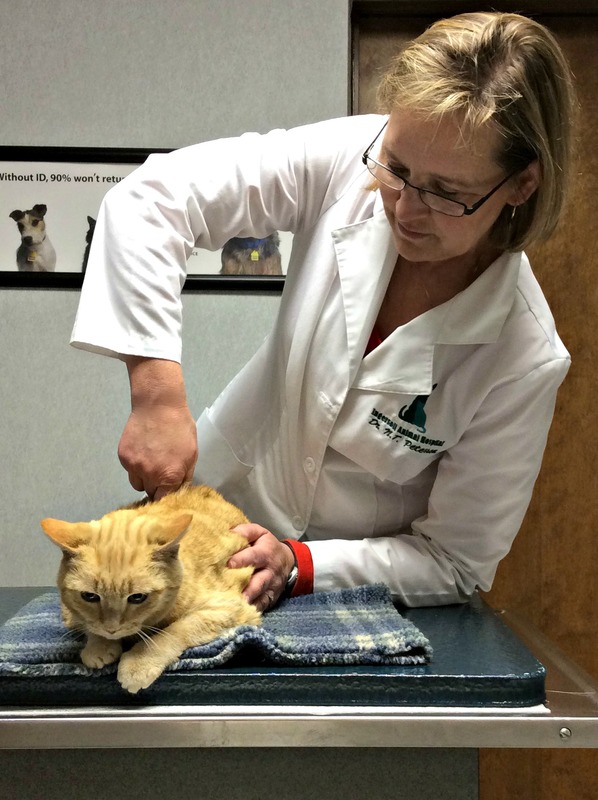 What are the benefits of a veterinary rehabilitation program? After a comprehensive initial examination, an individualized rehabilitation program is designed to help your dog or cat achieve a higher level of healthy mobility. Our goal is to keep sporty animals active, aging pets young, and dogs or cats facing specific medical conditions as happy and healthy as possible! When rehabilitation sessions, pain management and home exercises are combined into a comprehensive program, your pet will regain not just function and strength to the affected area but will be more comfortable and able to enjoy life. Yes we do! We have several happy feline patients who have recovered or shown marked improvement with therapy. Cats generally respond very well to acupuncture, chiropractic and many other techniques or modalities that can be used to speed healing, improve comfort and regain mobility. My specialist or primary care veterinarian recommended rehabilitation. Why do I need an initial rehabilitation examination? A referral from your regular or primary care veterinarian, while preferable, isn’t necessary in order to book an appointment with Pawsitive Strides. We will be in contact with your regular vet throughout the duration of your pet’s rehabilitation so they remain up to date on what we’re doing and your pet’s progress. What are some conditions that physical or veterinary rehabilitation is used for? Will you keep my family or primary care veterinarian informed of the care my pet receives at PSVRT? We work closely with your primary care veterinarian. After every evaluation at Pawsitive Strides, a thorough report is sent promptly to the patient’s primary care veterinarian and specialist (if applicable). How do I schedule my pet’s initial appointment? 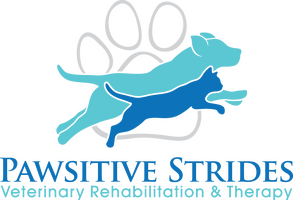 To schedule an initial consultation exam call us at (515) 575-9655 or email us at Pawsitivestridesdsm@gmail.com Our staff will help you with any questions or concerns you might have. Can I stay with my pet during the treatment sessions? You can definitely stay with your dog while he or she is here. In fact, we encourage it. We like owners to participate so they can continue to do exercises at home. Also, many dogs enjoy having their owner’s support while they are here. However, drop-off services are available. The number of sessions required depends on many factors. The PSVRT rehabilitation team will tailor a plan to meet your pet’s and your individual needs. How long do exams or treatments take, and how often do I have to come? Initial consultation examinations take about 1-½ -2 hours. Treatments typically range between 30-60 minutes. How frequently your pet will need to be seen will depend on their condition and severity. Some patients will start out 2-3 times a week for a severe or acute condition while others start out less frequently. I’m worried about cost. Is rehab affordable? We are all pet owners ourselves, and we understand that caring for a pet in need of rehabilitation can be a financial strain. Many pet insurance companies cover veterinary rehabilitation and we encourage you to check your insurance plan. We accept Care Credit and work with you to the best of our ability to tailor your pet’s treatment plan to meet your goals and to help you afford the care your pet needs. All payment is required at the time of services. Unfortunately, many pets are overweight or have poor conditioning. This makes it more likely for them to develop a variety of health conditions, such as arthritis, diabetes, ligament injuries, and stress on other body systems such as the heart and lungs. Conditioning, fitness, and weight loss are goals that can be obtained with a comprehensive plan from our veterinary rehabilitation team. My dog doesn’t have an injury. Can he still benefit from rehab? Definitely! Just like people, pets can benefit from a regular exercise program. If you are interested in setting up a conditioning program for your pet, please contact us to schedule the initial consult. This will allow us to evaluate your pet and make sure there are no contraindications to your pet beginning our conditioning program. Does my dog have to be a rehab patient to use the underwater treadmill? We have fitness swims available by appointment for dogs to increase their conditioning to burn off extra energy or to have fun in the water. All fitness swim dogs will need to have a Fitness Exam with out veterinarians prior to using the UWT. We are happy to offer day boarding for our rehabilitation patients for a small fee. Please let us know when scheduling if you would like to leave your pet with us so that we can reserve one of our day boarding spots. Also, please bring any medications that will need to be administered while your pet is at PSVRT. What if I don’t have time to work with my pet at home? The home exercise program (HEP) is meant to complement your pet’s rehabilitation sessions performed here at PSVRT. We recognize that your lifestyle and time constraints may not be conducive to performing all the additional exercises at home. We will work with you to develop a program that will fit your schedule while still benefitting your pet. Please let us know what you feel you can perform and our rehabilitation team will work with you to make this a positive part of your pet’s rehabilitation experience. I cannot come to PSVRT for routine rehabilitation appointments, is it beneficial to come for an appointment for a home rehabilitation plan? Absolutely! After assessing your pet, we can form a rehabilitation plan that works logistically for you and your pet. This can be a plan where most of the activity is done at home, with only an occasional visit to PSVRT for reevaluation. It is very common for your pet to be tired after rehabilitation, especially early on in the treatment plan. This should improve over time as your pet’s physical condition improves. If your pet seems sore or uncomfortable, please let us know so that we can adjust the rehabilitation plan, or discuss medications if needed. Should my pet have physical or veterinary rehabilitation after an injury or surgery? Consultation with your pet’s surgeon, or primary care veterinarian, review of history, full physical examination, and discussion with you will dictate the necessity of physical or veterinary rehabilitation. Many patients respond very well to physical rehabilitation and have a faster return to function after injury or surgery.